The Atlanta-based restaurant chain’s new coffee qualifies as specialty grade per the standards of the Specialty Coffee Association of America and only the top 10% of coffees consumed worldwide meet this quality designation. THRIVE Farmers’ blend is also unique to Chick-fil-A as it has been crafted with characteristics and flavors that complement the chain’s breakfast menu as well as allows it to stand alone as a premium cup of coffee throughout the day. The hand-picked, medium roast coffee offers a rich balance of flavors not typically seen in the quick service industry, including notes of caramel and cocoa with a light citrus finish. The proprietary coffee blend starts at $1.59. Chick-fil-A’s new iced coffee is handcrafted daily and prepared with an exclusive blend of THRIVE Farmers’ cold-brewed, specialty coffee beans and fresh two percent milk, sweetened with pure cane syrup and served over ice. Available in original and vanilla, iced coffee is available in 16oz. and 20oz. servings and priced starting from $2.29 and $2.59, respectively. THRIVE Farmers farmer-direct platform includes a unique revenue sharing model that stabilizes the price paid to farmers year over year. 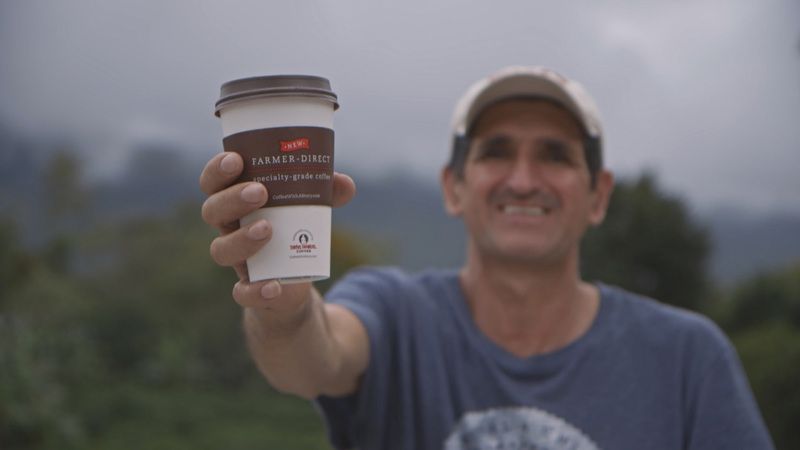 THRIVE Farmers signs contracts with actual farmers and farmer groups to supply Chick-fil-A coffee, and the farmers’ payment for the sale of their coffee is not tied to the volatile commodity markets. Instead farmers maintain an economic interest in their coffee from the time it leaves the farm until Chick-fil-A purchases it from THRIVE Farmers. By eliminating all non-essential layers in the supply chain, this model creates economic sustainability for farmers because they can earn more money, up to 10 times more than through traditional models, which allows them to reinvest in their communities and crops. Atlanta-based Chick-fil-A, Inc. is a family owned and privately held restaurant company dedicated to serving the communities in which its restaurants operate. Known for its original chicken sandwich, Chick-fil-A serves freshly prepared food in more than 1,800 restaurants in 39 states and Washington, D.C. THRIVE Farmers is changing the coffee industry through an innovative revenue sharing model that aligns the interests of coffee producers and consumers by directly contracting with farmers and farmer groups. The THRIVE Farmers model involves farmers in the supply chain from seed to cup, giving consumers sustainably-sourced, specialty-grade coffee while providing farmers with economic sustainability to invest in the future of their families and farms. Now, farmers are financial stakeholders and are no longer subject to the volatile commodities market, and consumers know who grows the coffee they enjoy every morning. THRIVE Farmers, pioneered in Costa Rica, now works with over 5,000 farmers in the world’s premier coffee growing regions. To learn more, visit www.ThriveFarmers.com.